Mapping Afghanistan: a 12-page artist book. Stem text by Susan Tichy, through-text from Robert Macfarland’s Mountains of the Mind. Artist-made paper by Brandon Moore-McNew & Susan Tichy (abaca, bamboo threads, & Army Combat Uniform fiber: rayon, Kevlar, nylon). Photo by Susan Tichy, 2012. On paper, imperialist wars are always won: superior knowledge, superior firepower, and superior wealth guarantee the outcome. And yet, all invasions of Afghanistan have failed. My husband was a veteran of another paper war, Vietnam, and, later, a traveler who fell in love with the high, wild mountains of Afghanistan. The first veteran of the Afghanistan war whom I happened to meet was undergoing reconstruction of his leg, a high-tech version of a surgery my husband endured in 1967. The second was Brandon Moore-McNew, a poet traveling a very different path. Our collaboration began in a workshop by the Peace Paper Project in May 2012. 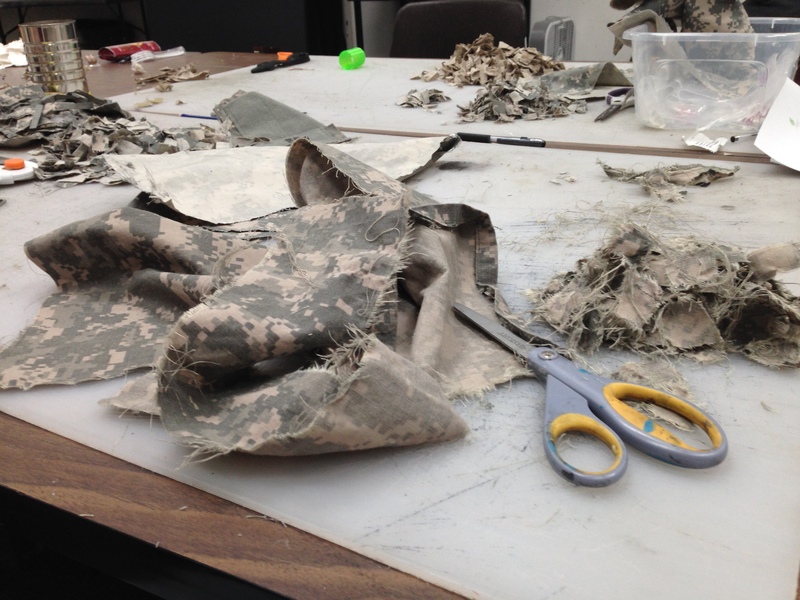 We cut Brandon’s uniform into small pieces, pulped it, and, in his words, gave it a new mission as a medium for poetry. My contribution to our paper was a handful of threads from two scarves given to me and to my husband in March 2000 by a mountain guide in northern Vietnam. For me, those threads add the element of time: transformation, healing, journeys of return. After the paper came the poem. Found text + mesostic form = a way to cut an abstract line through a collection of information, a path over landscape that may be physical or spiritual, false or true.